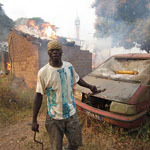 Right now, Anti-balaka militias are carrying out violent attacks in an effort to ethnically cleanse Muslims in the Central African Republic. Absolutely signed!!!! Thnx for posting hun!!! Thanks Cal - signed and shared - we really need a human rights section. CAR is a total catastrophe, like so many countries in Africa!! I just hope that someday they will sort out their barbaric issues and THAT, whilst there are still people available to do it with? Why is it that it's always the west that is called upon to sort out wars such as this as it's Muslims who are being killed why don't the Arab states do their own dirty work.It cant be because they are short of money. S&N I wish people would stop judging and persecuting others. Live in HARMONY and PEAce!!!! Signed Cal...This is the complete opposite of what we see in in countries dominated by muslims. I would like to see morte petitionsfor the non muslims in other countries where . muslims dominate. I would like to see petitions for all the Christians being slaughtered by Muslims. The UN didn't say a thing about that until the Christians started fighting back. That's the only way to deal with them. Noted & signed by both of us. And please get rid of thos spam!! !